Yesterday I found myself demonstrating for a student Chopin's dreamy "cello" prelude, number 6 from opus 28. The challenge here for pianists lies in the disparity between the two hands, coordinating a vertical, gently throbbing right hand with the long horizontal lines in the left, perfectly encompassing the cello range. "Show me why it's a cello prelude," he demanded. "I just did," I responded glancing up from the piano in time to see him pointing toward my cello in its cradle at the foot of the piano. "No, show me on your Strad." "Shhh," I responded. "Don't say that out loud." I often referred to my Man Claudiu cello from Stringworks as a Stradivarius, sent to me by mistake, and I didn't want them to take it back. This cello has become such an integral part of my daily routine that I couldn't bear to part with it. 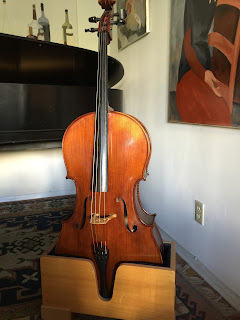 Claudiu carved my cello himself in Italy from elderly spruce and maple, to which he added a light antiqued oil varnish. I'm sure he harvested his materials from the same Italian Alps as did the great Cremonese master. My student had a point. Why not show him what we as pianists try to imitate. My Claudiu has a very complex, rich sound, but as I began to play I saw on my student's face an expression very near a scowl. I couldn't have been that bad. "I can't even come close," he said. "It's such a singing sound, and when you change registers, well it's all of the same fabric. And legato!" Ah, yes. There's the rub. On the piano we can only create the illusion of legato by carefully placing each note in dynamic relation to the preceding one. I told him not to despair. We make up for our deficiencies in the legato department by getting to be the complete orchestra. This was a lesson well-learned; there's something to be said for imitation. When he finished playing he looked longingly at the Claudiu. "Do you think Stringworks would send me a Strad by mistake, too?"